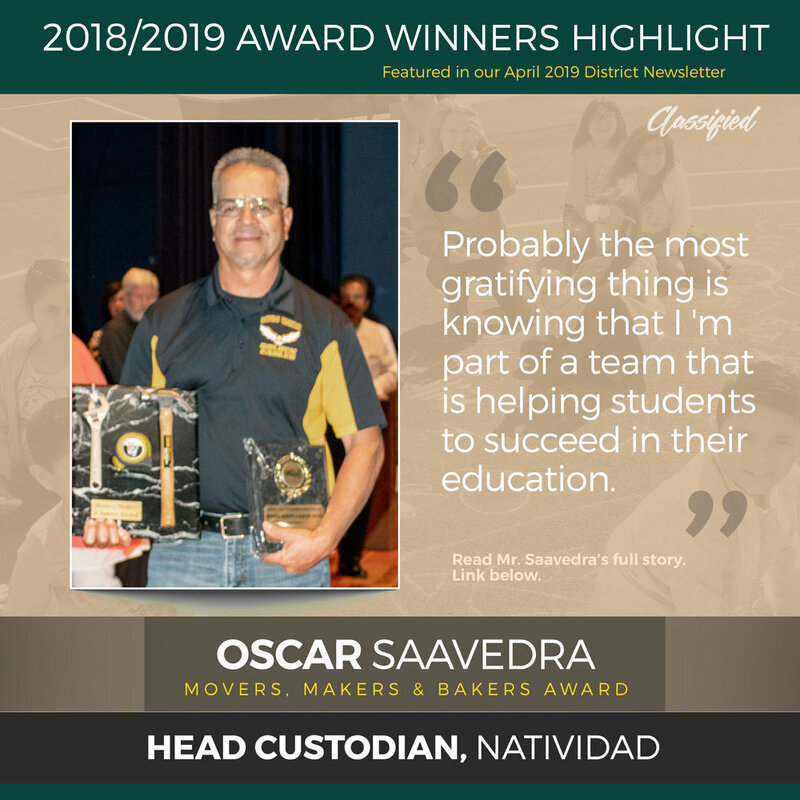 2018-19 Welcome Back Breakfast Award Winner, Oscar Saavedra is awarded the Movers, Makers & Bakers Award. For our second interview for Part 3 of our 3-part series, we spoke with Movers, Makers & Bakers Award Winner, Oscar Saavedra. What’s your title and school location? How many years have you been with the District Office? What brought you to Salinas City Elementary School District? I wanted a stable job, a place where I could use some of my work experience and learn more about being a Custodian. I heard from others that SCESD was a great place to work at, so I decided, why not, and here I am enjoying myself working at SCESD. What keeps you motivated and inspired on a daily basis? Simple things, like a "Thank You" from a teacher for replacing a light bulb in their room, a "Good Morning" from a parent dropping off their child, a note from a student thanking me for helping find his backpack, these simple things make my day. What does your award mean to you? It means that I'm doing my job, something I enjoy, and that others appreciate what I do for them. What is the most gratifying thing about your job? Probably the most gratifying thing is knowing that I 'm part of a team that is helping students to succeed in their education. I'm not a teacher, but I hope that having a clean classroom to study in will let them know, we all care about them. Any advice for new categorical analyst or people starting for the District? Keep doing your best, our students need you.